Multiglaze use a co-extruded cellular constructed fascia board which has a high impact UV stabilised skin, heat welded to the face of the board. For soffits, we use a solid, extruded match board to ensure sufficient support when fixing new soffit’s, we fix new treated timber noggin’s at suitable intervals, to avoid bowing of the board’s. Once existing fascia and soffit is removed, all ends of exposed timber are treated with wood preservative. On occasions we come across rotten timbers which were not evident from an earlier survey. In this event we will inform our clients of any additional charge for extra materials and labour, as it is not company policy to cover up rotten timber. A string line is run from the first to the last rafter foot to insure a straight finish. This means we cut back to the line or pack up with P.V.C.u. to the line, as appropriate. Corner joints will be either mitred or finished with a corner trim. The Fascia is fixed with a pin, constructed from a stainless steel shaft having a P.V.C.u. head. These fixings are both neat, as well as minimising the possibility of rusting or rust stains. Sometimes, when screw fixing is required stainless steel screws will be used with P.V.C.u. Caps.The condition of your gutter felt is checked, and f the felt has deteriorated, we would raise the tiles back to the fist batten and insert new felt which will overhang the new gutter. 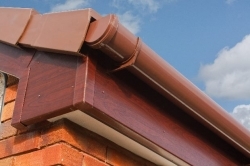 New guttering will be provided, where required, which are available in black, white, brown or grey, in a choice of square, round or ogee shapes. All gutters and down pipe brackets are always fixed with stainless steel screws. We provide adapters to match new with existing gutters. We do not refit old guttering to new fascia. All unwanted timbers and guttering are removed by our fitters, free of charge. Other than the occasional wipe down, your new fascia’s, soffit’s, gutter’s and shiplap will be totally maintenance free. All materials and workmanship provided be MULTIGLAZE are covered by own, fully comprehensive, 10 year guarantee. Excluding guttering which carry’s a 5 year guarantee.